My name is Michael Schwarz and my interest in abandoned structures started at a young age when I first viewed the film “Titanic” because of the emotions evoked by the remains of the ship at the bottom of the Atlantic. While making one of my short films, I was out scouting locations but was having difficulty obtaining permission to shoot on sites of currently active businesses. My friend was kind enough to tell me about an abandoned circus in Edmond, OK. I was intrigued and went to see the location for myself. I explored the location to see how to build a short film around this interesting site. This stirred my interest which lead me to other abandoned structures. 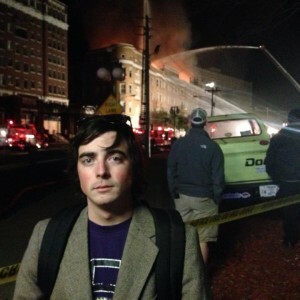 In January 2012, I saw a television newscast reporting an abandoned building which was on fire. This building, Dunjee High School, was a place I had visited many times before. That same day, I went to the school to photograph the remaining ruins of the building. There I met the widow of the former principal of the school. Her story evoked strong emotions because, through her tears, she revealed this building was the last tangible memory which remained of her husband. This story changed my perspective of abandoned buildings from this point forward. I started to realize they weren’t just buildings but places that hold history and valuable memories for many people. Likewise, when fire destroyed the Majestic Hotel (From picture above) in Hot Springs in February 2014, it also destroyed part of Arkansas history. A history that can still be relived by looking at the some of the photos I took with 20 trips inside, including my last, just two weeks before it burned. After I started college in Conway, I wanted to do more than just share these pictures with friends on social media, so I started this website. I have explored and documented over 300 locations in Arkansas and Oklahoma. In addition, I want to continue this diary of bygone days, preserving them for generations to come.